All these rich greens usually mean vegetation, but this is an arid, salty land almost totally inhospitable to plants. Instead, those are the markers of a brine rich in minerals, concentrated as the water evaporates. Dabuxun is part of Lake Qarhan, the largest salt lake in China. Qarhan is a 2,261 square mile basin that only intermittently fills with water. The playa includes nine smaller lakes, where Dabuxun is the largest. Water dissolves nearby rocks, concentrating minerals in a solution. The brine then evaporates from the lakes, leaving behind mineral salts like sodium chloride (rock salt), potassium (potash), bromine, halite, gypsum, and magnesium chloride. 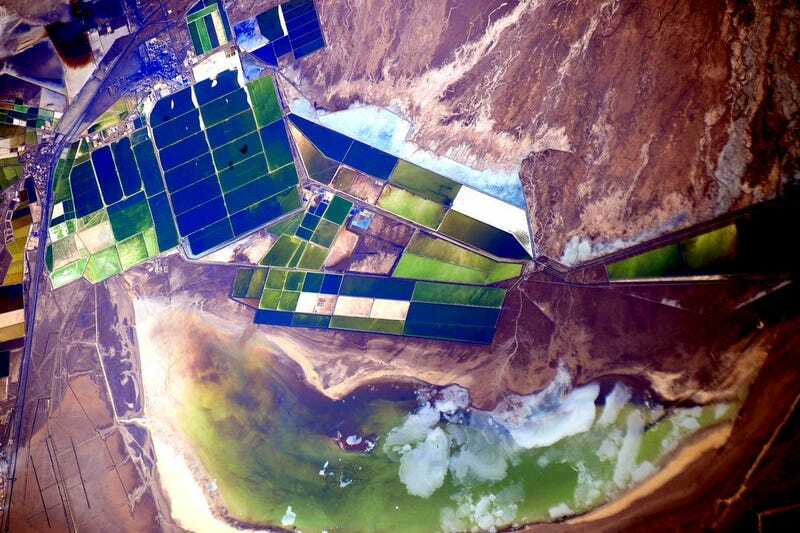 Humans help this natural process along by building square evaporation ponds. The extracted minerals are used in industry. Sodium chloride is purified into table salt, while potassium is a key ingredient in fertilizer.